28 July 2016 - Three classic motors have been brought back to life in just three months for the first ever eBay Car Challenge using only parts and accessories from eBay. A Volkswagen Beetle, Riley Kestrel 1300 and Triumph GT6 Mk3 were restored in painstaking detail after their owners saw off hundreds of other amateur restorers to secure a £4,000 restoration budget provided by eBay. The 1971 Beetle – AKA Godfrey – has been restored by the Challenge’s youngest competitor, Robyn Avis-Smith, an engineering student from East Sussex. As well as the world’s most prolific production model, the eBay Car Challenge also involved a rare 1968 Riley Kestrel 1300. 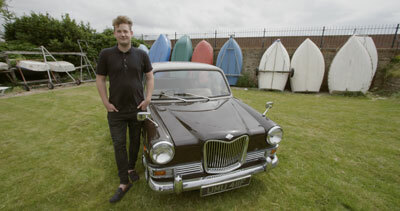 Essex-based restorer Charlie Renwick inherited the British classic from his great grandmother. His first task was a daunting overhaul of the Kestrel’s suspension, but it was the detailed touches that made the project special. Charlie sourced original replacement door handles, a walnut gear stick, the “1300” badge – even original BMC green paint for the engine block. The final challenger was David Newell's glorious Triumph GT6 Mk3. Murray Lambell, director of retail car parts & accessories, eBay, says, "Three months ago, we picked Robyn, Charlie and David’s projects from the hundreds of incredible entries we received for the eBay Car Challenge. We gave them £4,000 to spend on eBay.co.uk and a deadline of July. The rest was up to them and they’ve really delivered. "Watching each car come back to life has been genuinely exciting, and I’d like to congratulate all three of them for turning their rusty relics into gleaming show stoppers."